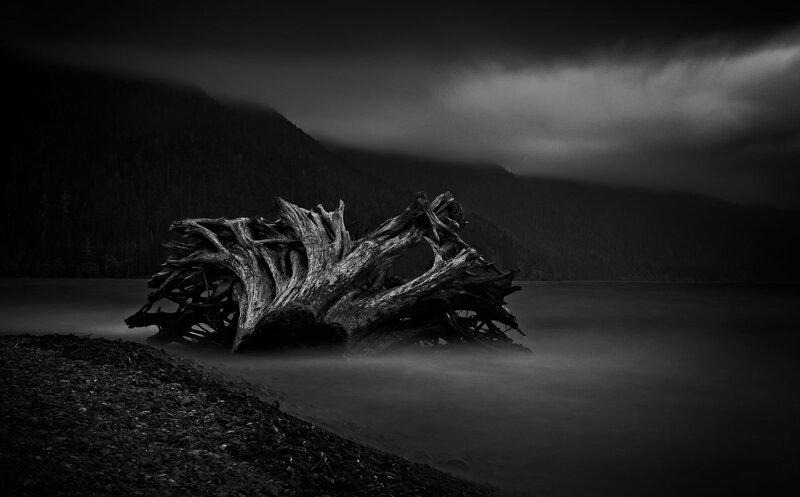 A fallen tree in transition trapped upon the shore of Lake Crescent to be battered by the waves and the weather of Storm King. Olympic National Park. Capture: Fujifilm X-T1. 70s, f/11, iso200. - Zeiss Touit 32mm. - Lee Seven5 Big Stopper ND & Polarizer. - Acros-R B&W simulation. I am much happier with this now that it looks like how I captured it. I first did this in LR and could never get it right because of my Fujifilm raf file. PhotoRAW is working much better for me. 😀 My next project is to revisit all my favorite photographs processed in LR and fix them in PR. The Lightroom compatibility issues with RAF have been widely spoken of. I will be honest and say that it has been a major reason why I never warmed to the Fuji X line. I can't operate without Lightroom - my workflow is too deeply embedded in its operation, so no X-trans for me. Learning new software is something I used to actually enjoy, but as my years move along faster I find that the time is better spent doing other things. I will at some point soon though, talk about Luminar 2018, which I have a complimentary copy of. The angles are a little bit different, but growth of the trees in the intervening 13.5 years made that necessary to avoid blocking some of the key features of the station. I also grabbed a few other shots whilst there. I think this one works better as black and white as the colours of the city lights draw my eyes away from the bar on the island below the bridge. Went on an 11 day hike across the Bailey Range in Olympic National Park. Forest fires had Washington and Oregon smoke filled and created some unusual colors and clouds. These clouds seemed to mimic the sub-alpine fir silhouette.